When traveling, one thing I can count on is that local parks are probably the best way to get to know a city. For some cities, it's due to a signature park or tourist attraction within the park. For the rest, I find it most satisfying to explore a city through a linear park. Wikipedia defines an urban park as a "park in an urban or suburban setting that is substantially longer than it is wide". This usually means there are two ends to the park, and it is designed to encourage pedestrian traffic between the end points (i.e. a trail). A properly designed, public, pedestrian- and bike-friendly pathway can allow visitors to see more of the city while simultaneously activating otherwise deserted spaces. Some of this activation comes from re-purposing paths that are no longer in use. 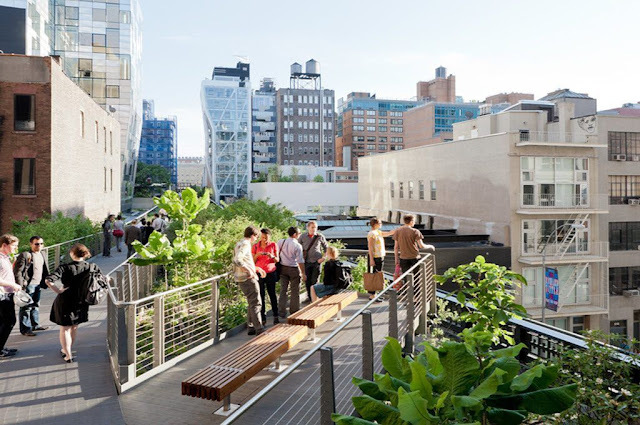 The High Line in New York used to be a stretch of railroad elevated railroad. Now visitors on The High Line can walk parallel to 10th Ave, but with a lot more green and some escape from the rush of the streets below. Other examples include waterfront walks. 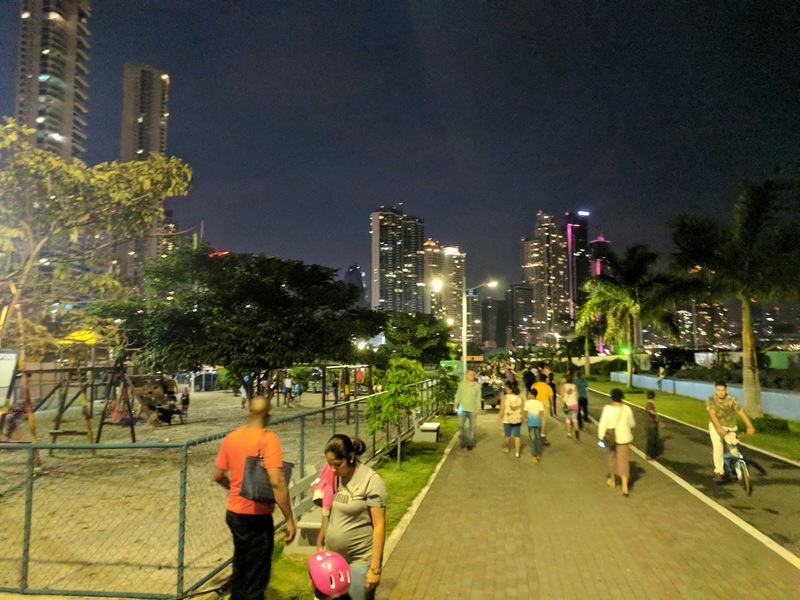 While waterfronts are generally already pedestrian destinations, these parks naturally draw visitors to walk along side them. 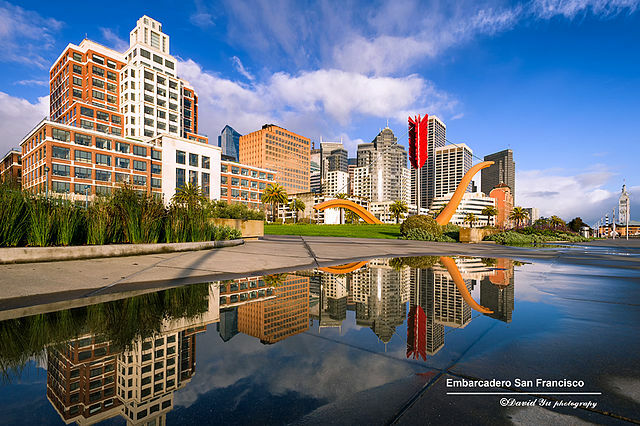 One example not far from home is the Embarcadero in San Francisco. The walk stretches from AT&T Park on the southern end to Fisherman's Wharf in the north. Along the way there is public art, a nice view of the Bay Bridge, restaurants, and of course, piers. My favorite example of a linear park is actually from a recent trip to Panama City (in Panama, not Florida). 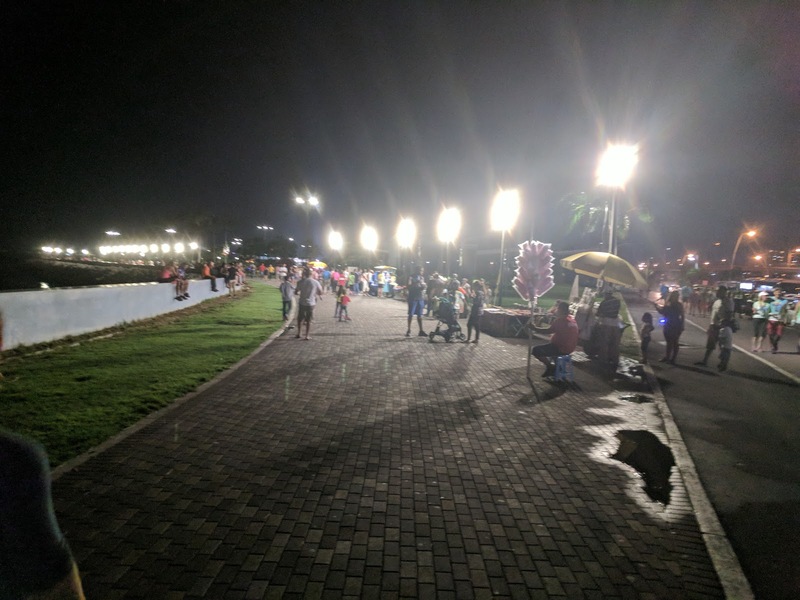 The Cinta Costera is also a park along the waterfront, but is on a different level when it comes to pedestrian involvement. I walked along most of it, which took approximately an hour. This park was the place to be for kids and adults, tourists and locals alike. The eyes, foot traffic, and lighting provided a sense of safety. The entire stretch of the park felt lively and festive. Wouldn't it be nice to have something similar in San Jose? San Jose doesn't have much of a waterfront to flaunt, and it doesn't (yet) have large stretches of unused rail or road to convert into a park. Until Alviso is a more appropriate destination for visitors, the park with the most potential to become an urban linear park to showcase the city is probably Guadalupe River Park and Trail. A large section of it already intersects with the most urban part of San Jose (and the South Bay). It is somewhat connected to various pedestrian walkways, and isn't fully contained within a large, isolated park. 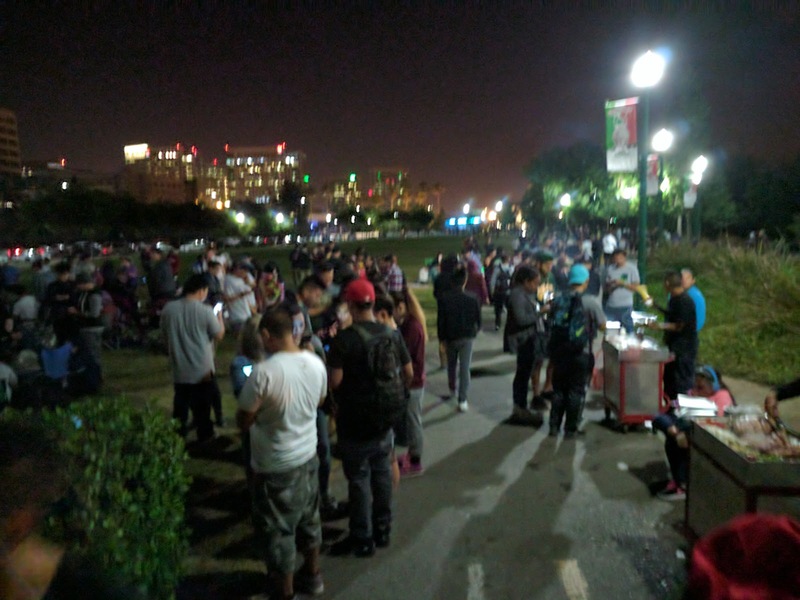 Interestingly we caught glimpses of what the park could become during the Pokemon Go craze. Just the equivalent of a couple of highway exits down from the park, masses of people gathered between the SAP Center and Little Italy near the Guadalupe River trail. At night there started to be music, hot dog carts started to show up, and people eventually seemed to go to the park just to hang out. The natural benefits of a successful public space were in full display, albeit a result of the mobile game. Over time, the crowds started to dwindle until the park was empty once again. However, I couldn't help but wonder how great it would be if we had people enjoying our parks this much on a daily basis. From what I see, hear and read, the biggest obstacle preventing many people from visiting parks around San Jose is the fear for their safety. In my observations about Cinta Costera, I mentioned that it felt safe. That's what prompted me to take the one hour walk rather than call a taxi: the park both intrigued and welcomed me. It was easy to call for help with so many pedestrians nearby. The open layout meant I could see what was coming from a great distance. It was next to an expressway, so not many cars were parked on the side of the road. There wasn't a single poorly lit stretch of the path. On the contrary, the Guadalupe River Trail is mostly isolated rather than integrated with the city. The miscellaneous trees and bushes mean it's hard to know what's ahead or around the corner. While San Jose is still one of the safest large cities in the US, its reputation within the Bay Area has suffered in recent years due to the growing homeless population (and related news). 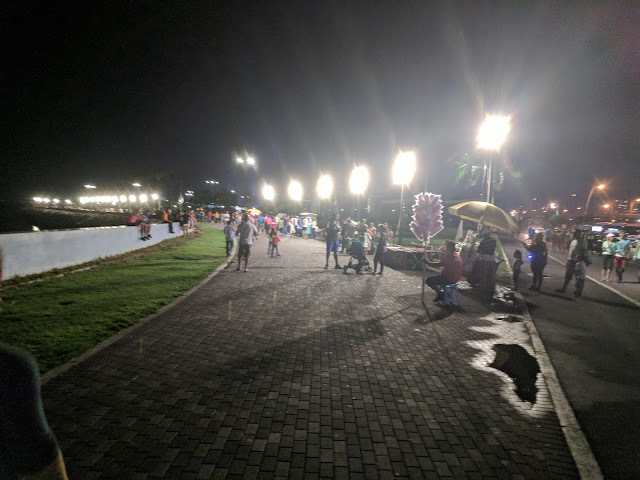 With most people afraid or uncomfortable walking through the parks, and refusing to visit, the opposite of the Pokemon Go impact occurs. The quieter the park, the more people are worried that something bad may happen in the next corner, or behind the next bush, and no one would be around to help them. It's a cruel cycle. There did appear to be an effort to re-imagine Guadalupe Trail Park from 2009. As far as I could tell, this was nothing more than a brain exercise for the planning group. The presentation certainly looks interesting, but is also clearly outdated. For example, with movement on the St. James Park redesign (which includes a stage), does it make sense for Guadalupe River Park to also have a major entertainment venue? I do like many of the ideas outlined in this plan (an efficiently run fountain would be a great contrast to the mostly dry river), but it's missing a critical consideration. The park is connected to the trail. As the downtown, Diridon, and Japantown areas become more pedestrian friendly, the trail will be the best way for many locals to arrive at the park. Revamping with park itself without turning the stretches of Guadalupe Park Trail into a safe, welcoming walkway could mean that the park remains barren and inactive during most of the week. As the urban core of San Jose develops, it'll be increasingly important that there's an all-ages, all-genders public space for us to gather as a community. Focusing on making Guadalupe River Park and Trail the best they can be would help us achieve that goal. A comprehensive plan must include turning the urban stretch of the trail into our own take of the urban linear park concept. It has the potential to not only become a unique attraction to the area, but also become a crucial pedestrian pathway between neighborhoods. They built a bunch of tennis courts long ago near SAP/Little Italy. They are mostly unused now & take up space. They should be converted to parking for the new Enoteca Osteria restaurant & the park. The new restaurant will have almost no parking whatsoever. People in San Jose like their parking. It would make the tiny Little Italy section much more accessible and would mean more people hanging around at night walking the park. I see those courts used all the time--often for uses other than tennis. Very good article from Laurence. His reason #1 is also the same reason I don't walk Guadalupe River Trail at night, and I'm one of the biggest SJ booster around. Fountain Alley is safer for me at 3AM, or at least in my view, than the River trail.